Roll on hair and leave on to make curls. If using a hair dryer for faster job, blow from a distance of 15cm to 20cm away from rollers to avoid making the rollers out of shape. 1. Cute & 5cm in diameter. 2. Comes in 6 in a pack. 3. Curls your hair easily. 1. First, wet your hair with water or with hair mousse. Or after bathing, wait for your hair to be 80% dry then put on the curler. Applying mousse is optional, but it helps to maintain your hair curls. 2. After putting on the sponge balls, go to sleep, & you'll wake up with beautiful hair curls the next day. For Yellow, it will be under Pre-Order B. This Magic Hair-Drying Cap is made of microfiber with the water absorption rate as high as 7 times of normal fiber. Using the Magic Hair-Drying Cap, you can dry you hair fast & easy, avoid hair damage caused by electric hair dryer and also prevent moisture from penetrating through your skull. Random Colours will be given. 1. Bend forward your head & let your hair flow down naturally. 2. Put on the magic hair-drying cap & twist around the hair. 3. 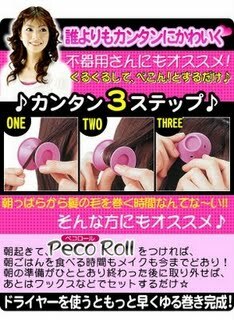 Fold back the magic hair-drying cap & button up at the rear. 4. Able to wash with soap or wash in washing machine. However, DO NOT PUT SOFTENER & DO NOT BLEACH! 1. Comes in 2 in a pack. 4. Suitable to use during special occasions as well as normal casual going-out days. 1. Microfiber with water absorption rate at 7 times of normal fiber. 2. 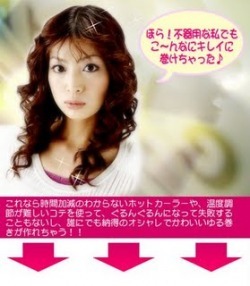 Avoid and minimise hair damage caused by using hair dryer. 3. Random colors will be given. 1. Able to straighten your hair, with the help of hair dryer. 1. After washing your hair, dry it completely. 2. Then comb as you use hair dryer to blow. 1. 3-in-1, Straightening, Curling & Hair drying. 2. Comb contains self heating elements at the core. 3. Spreads out heat equally within hair. 4. Thus, easily curl & dry your hair. 5. At the same time, the comb is able to massage for your scalp. 6. Thus, able to reduce dandruff & enhance growth of hair. 1. When heated with hair dryer, the heating elements at the core absorbs heat. 2. While the brush is still warm, wrap your hair around it, hold for 20 - 30 seconds for loose waves. 3. Can be used to blow fringe; same method can be used. 1. Helps to curl your hair fast. 2. Able to trap heat well, therefore forms the curls easily. 3. Has 3 holes for you to blow hot & cold air in. 4. Able to use with any curling materials, such as the strawberry sponge etc. 1. Put on your curling materials. 2. Put on the Alumi Curl Cap. 3. Use your hair dryer to blow hot air into the 3 holes available. 4. Please do not blow the hot air into the hole directly. 5. After that, blow cold air in to stabilise & strengthen the curls. As Barbie Hsu had mentioned in her book, if you want to have silky, shiny hair the secret is to own a comb that have the function to massage your hair while you comb. And the times you comb your hair have to exceed your age, as when you grow older the more you need to massage your scalp. 1. Helps to massage your scalp. 2. Use it everyday for the best effects. Instock : Only 2 black available; 1 reserved. 1. 10cm by 5cm, 2 pieces per packet. 2. Has Velcro-like hooks that keeps hair gently in place. 4. Does not crimp or mess your fringe when in use. 5. Helps to keep your hair parting. 6. Easy to use & hassle-free. 7. Extremely useful when you are putting make up or masks. 2. Helps to curl your hair, but to be used together with hair dryer. 3. Easy to use & hassle-free & will not damage hair. 4. 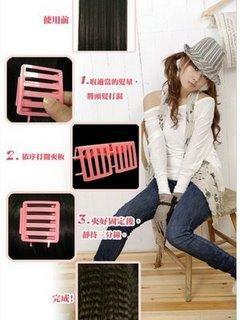 Special in-out design, so that curled up hair won't fall easily. D.I.Y Hair Plate to make waves or pop-corn waves instantly. Currently HOT in Japan & Korea. 2. 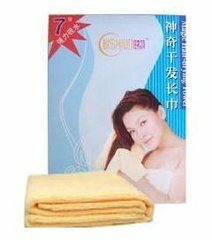 3pcs in a packet; usually need 3 packets (9pcs) for whole head. 3. 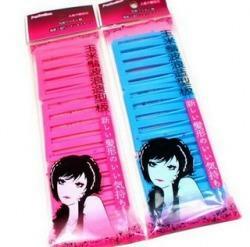 Helps you to make a temporary hairstyle in a short period of time. 4. Easy to use & hassle-free & saves time + effort. 5. Won't damage hair or cause hair to be frizzy. 1. Use it when your hair is half-dry. Then after clipping on the hair plates, use hair-dryer to blow it dry. 2. Product is designed with special curves. 3. Specially use to style your hair end faster & easier. 1. Wet hair end with water. 2. Position & clip product on hair end. 3. Blow dry with hairdryer. 4. Perfect if used with fringe clipper. 1. Allows you to have natural curling fringe faster and easier.